Wessex Artiste Ken Van Hoylandt is a Belgium-born musician and teacher, boasting a lifelong affiliation with brass; starting with the Trumpet at the tender age of 5, and progressing onto the Tuba from the age of 9. In May 2016, Van Hoylandt was announced Soloist Champion of East Flanders, Flanders and Belgium on the Eb Tuba, and in the following September started conducting his first youth band, a project he considers to be “a lot of fun!”. The future is bright for this undeniably passionate young Tubaist, who will be starting at Brussels Conservatory within the coming year. 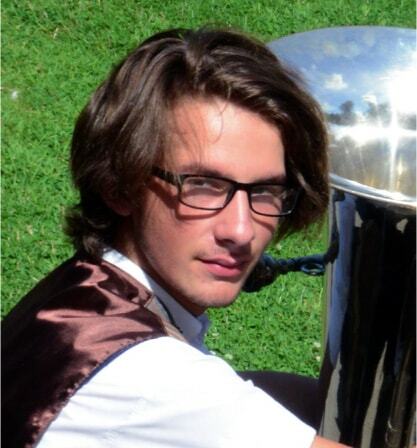 “I first discovered Wessex Tubas in my search for a new CC Tuba; being a young player, I needed something of exceptional, professional quality that I could realistically afford. This came in the form of the CC Tuba ‘Wyvern’, my favourite of all Wessex’s designs. “The ‘Wyvern’ sounds so gigantic and powerful, but still plays so easily! Unlike most other CC Tubas, you can really get away without having to pull the sides around, and the tuning is incredible. It plays and sounds far better than any European instrument costing twice as much.